Hmmm..... Yeah, that's not a good way to start the review is it? So it was poured into a glass of ice like I do for all my reviews, only I was so excited I didn't let it chill first in the fridge. 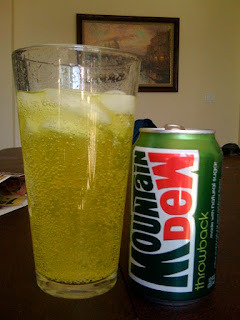 The Mountain Dew Throwback seemed flat, less sweet, and more watered down. The watered down part I may be able to chalk up to the temperature at the time of the pour, but the flatness and the lack of sweetness I can't yet explain. I'm going to give it another try later. We can hope it goes better. If not, the benefits of sugar over HCFS are going to need be real. My wife and I are planning ahead a little; looking for a place to move after we sell our house. We stumbled upon a Safeway and I decided to check for Mountain Dew Throwback. 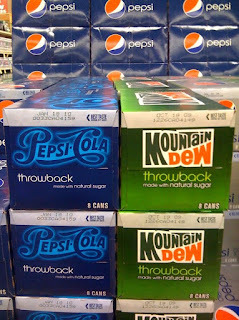 I found it with the Pepsi Throwback on an end cap and on sale. I will provide a review soon. 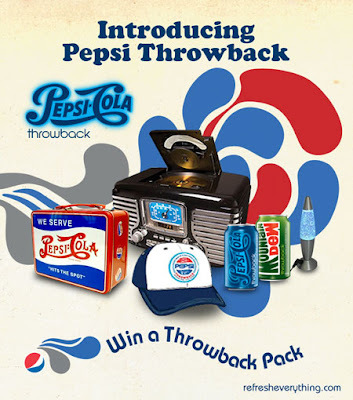 Win a Pepsi Throwback Pack! Check out this review at bevreview.com. This is the site that I've been following via Twitter and my blog reader. This is where I first heard about Pepsi Throwback, Mountain Dew Throwback, and Pepsi Natural. Comment on the review and be entered into a chance to win the Throwback Pack pictured. I've only drank 2 cans so far but I really like it. Honestly, there isn't too much difference between Pepsi and Pepsi Throwback, as far as taste goes. 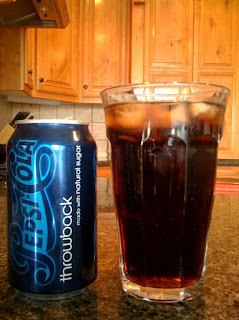 Throwback seemed to bubble differently than a Pepsi...less. There was a slightly different aftertaste, but other than that I didn't think it was too different. I did enjoy it. In fact, if there are any health benefits to sugar over HFCS, I'm going to hope that Pepsi Throwback sticks around after its scheduled 8 week run. I think I'll have to do a side by side comparison to give a better review. UPDATE: I just drank another Pepsi Throwback. I was initially using it as an ice pack on my face for a migraine headache I was suffering through, but then I realized the healing properties of caffeine and I opened the can. Here I sit 20 minutes later; the nausea is gone, the pounding in my head has lessened, and I'm starting to feel normal again. 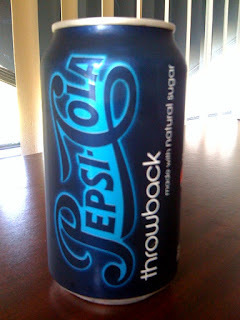 Oh yes, and I love Pepsi Throwback as much as Pepsi. Don't mess with the Russian Police, especially their SWAT team. And, don't drive the same type of vehicle with a similar license plate down the same street at roughly the same time as bank robbers. If you do, be ready for your vehicle to get destroyed. According to the description on YouTube, the first Porsche Cayenne was the same color and had a "177" in the license plate, causing the first attack to go down. They quickly realized it was the wrong vehicle, cleared the scene and waited for the next and correct vehicle. They bad guys did end up killing a bank employee so, you know, that's real to me. I'm fine with the mistake and the complete beat down of the second and actual thugs. I like the idiot who wouldn't get on the ground so they kicked him in the ribs. Then, one guy pulls his legs out and stands on one while trying to stomp on the other. Enjoy. Would You Risk Hell to Save Others? Love. This is my nemesis. I don't love. I can't love. It is impossible for me to love. People drive me crazy. I see through people's lies. I see through there problems to the root of what is really going on. I'm so annoyed and frustrated with the decisions they make. I can not be loving. BUT WHO THE HECK DO I THINK I AM??????????? The Creator of the universe, God, simply wants us to live lives that glorify Him. And we don't. We sin and sin and sin and lie and create problems and make horrible decisions. And God, does he hate us? NO! He loves us to the point of sacrificing His Son for us, to save us from ourselves. That is grace. That's love. "For God so loved the world, that He have His only Son, that whoever believes in Him should not perish but have eternal life." John 3:16. Romans 9 starts with Paul telling us he is speaking the truth when he says he has "great sorrow and unceasing anguish in (his) heart." Paul says he would be cut off from Christ for the sake of his brothers and kinsmen. He's referring to the unbelieving Jews. Paul had love enough for his fellow Jews that he was willing to be cut off from Christ (being sent to Hell) on their behalf so they would believe know Jesus was the Messiah. He loved to the point of complete sacrifice of his own eternal life. I am a reach. I am a worthless being, not fit for the kingdom of God, not fit to be called a child of God. I deserve Hell and damnation for eternity. The desires of my flesh control and rule me. The desire of my heart is overruled by the lust of the flesh. Lord take control of my life. Make the desires of my heart the controlling force in my life, as long as my heart is in line with your will. It's good people. It's good. 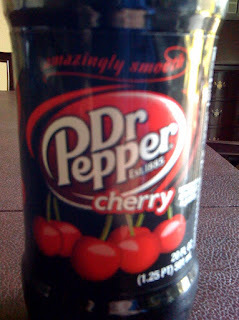 Taste is very similar to Pepsi but it's made with sugar not HFCS. I think my cousin and I bought the first two available packs in Auburn. We got them off the pallet in the back SaveMart minutes after the Pepsi truck dropped them. I'll have a full review later. 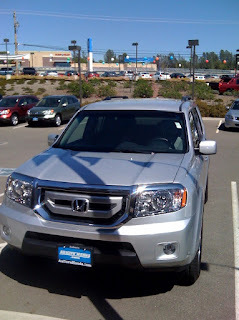 I'm usually not a huge Honda fan, but I gave the 2009 Pilot a test drive. And well, I'm impressed. It has decent power, comfort, control, and amenities. The 3 rows of seating are all usable, and there is still enough room for an umbrella stroller, a couple small bags, a few bottles of wine, 4 adults, and 2 car seats (oh that's the Napa trip we're planning with cousins). There probably isn't enough room for all of us for an over night trip with the needed "kid care" items, but it's close. Anyway, I'm still thinking with the deals that are available on the bigger Toyota Sequoia, I'd be better off going that route for a trip like the one we're planning. I guess for now we'll need to take the lavender minivan of the wives' grandma. AWESOME! The stress of the world, hard times, temptation, sin, times when we feel like everyone and everything is against us; these are the times when we can turn to scripture for comfort. Romans 8:31-39 is a great passage of encouragement and a reminder that God is powerful and in control. God is on our side, and when that's the case, no one can be against us. God gave us His only Son, a sacrifice for our sin. Christ died and was resurrected from the grave to pay the price for our sins. God provided this way for us out of His grace. And if He gave His Son, what will stop Him from giving us all things? No one has anything to hold against us as believers (as God's elect). Only God can judge us. Only God can justify us. Praise God for His Protection. This is cool. Web cam security works...if you monitor it. I think it's funny how the home owner mentions that the burglars are black...twice. Okay we get that they were black. I don't think that should matter, you racist. Haha. No, but I kid. Seriously, if time permitted, I'd watch my house from the Internet too. Of course, the computers where I work are locked down tight. I need the iPhone streaming video feature. Then I'd be in. This is going to be fast and this passage (Romans 8:26-30) has a lot in it so I may need to break it up. Although the suffering is nothing compared to the glory to be revealed, we still need help through this time on earth. The Spirit is our help "in our weakness." The Spirit provides direction in what to pray, He intercedes on our behalf with God, and works with our conscience to help us discern. "...the Spirit intercedes for the saints according to the will of God." All things will work for good for those who love God, "for those who are called according to His purpose." Again Paul talks about calling, just as he did in Ephesians. Paul lays out the process here. Verse 29-30 "For those whom He foreknew He also predestined to be conformed to the image of his Son, in order that He might be the first born among many brothers. And those whom He predestined He also called, and those whom He called He also justified, and those whom He justified He also glorified." In layman's terms, those God decided He would save before they even existed He called with an irresistible calling. After calling them to Himself He justified them through the death of Christ on the cross and soon they will be glorified in Heaven with Him. Praise God for His Spirit. Praise God for His calling, justifying, and glorifying. Romans 8: 18-25 is today's passage. All of creation suffers because of sin. Not just humans but all creation. And all of creation "waits with eager longing" for Christ's return. We too "groan inwardly as we wait eagerly for adoption as sons, the redemption of our bodies." Sin has caused all of God's creation to suffer. From the garden of Eden to where the world is now, so many drastic changes have occurred in the way we live and the way the world works. Man and animals were friends. Food was plentiful and available. God walked and talked with man. And so many other things. No pain in child birth. No toil for man. But sin has changed all of that. The world is now a hard, hard place. Sin has made it a struggle and a battle. But again, the suffering of this present time is not worth comparing with the glory that is to be revealed to us. We have hope; the redemption of our bodies. Verse 24 "For in this hope we were saved. For who hopes for what he sees? 25 But if we hope for what we do not see, we wait for it with patience." Sometimes I look at my life and my sin and my lack of faith and feel as though I may not be saved. But I shouldn't feel that way. I have hope in Christ. Sometimes it may not seem like I have "proof" of God or evidence of Him in my daily life, but I can hope with patience for Christ's return because He promised He would and that future glory will be revealed to me. I can take comfort in the knowledge of His sacrifice on the cross, saving me from sin and becoming the redemption of me body. Christ died to save me from my sin. Although sin has changed the world so dramatically, my God is able to overcome the sins of the world and save me. All to His glory and the glory to be revealed to us. Praise God for the Hope we have in Christ and the Revelation of His Glory. I read the first verse of the passage I was going to write about today and stopped. Romans 8:18 "For I consider that the sufferings of this present time are not worth comparing with the glory that is to be revealed to us." So often I look at the things I've gone through in just the last 5 years and think I've suffered. What a joke to think that any of that matters. These are things that God has allowed to be in my life because he knew I could either handle it, learn from it, or help someone else in. And for the most part, I've failed him over and over. And I continue to right now. I whine all day long about my job and my loss of the last one. I complain about all the other stresses my little family has faced with job changes to medical issues to financial struggles. Well it's time to start focusing on the glory that is to be revealed to us. We will have perfect EVERYTHINGS. In Heaven with the Almighty God, Creator, Savior, Lord, the Holy One, GOD, we will have prefect bodies, understanding, and perspective on who He is. Perfectly worshiping the one true God, we will forever be with Him. How much greater will the revelations of God's perfect glory be? We must stop considering our suffering as anything and realize the glory to be revealed. 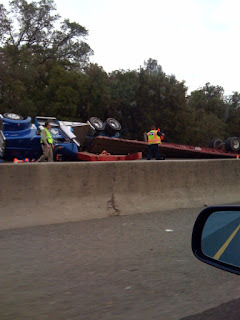 Driving the roads in Placer County really beats up on a vehicle, not to mention the drivers and passengers. I didn't notice how bad it was until I drove from Lincoln to Hwy 99 using the back roads. If you followed the map below, halfway down Nicolaus is the Sutter County line. When you cross into Sutter County, the pavement lets you know. It is so much smoother in Sutter County you can't help but realize the difference. View Larger Map But driving in Placer County has never resulted in this kind of pothole. This is a sink hole in the Ukraine. It swallowed this Golf almost whole. 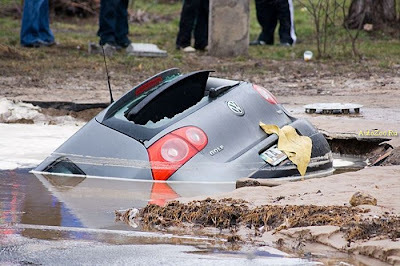 I've hit some pretty bad potholes but this is ridiculous. It might be time for a little money to be spent on infrastructure; here and in the Ukraine. 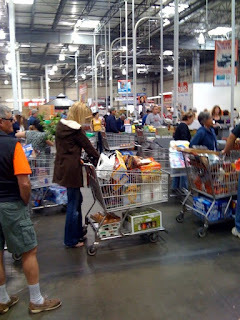 The wait time and the crowds at Costco are out of control. And yet the country is going into a financial tailspin. Weird. 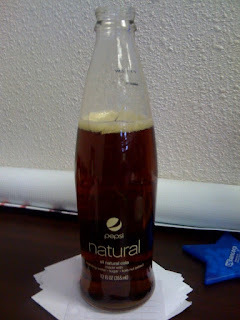 I can't stop drinking Pepsi Natural. It's so good. I hope the sugar has some health benefits.